May I please have help with this Legion D'Honneur? Hi, A very nice T'ai Federation Order of Military Merit you have there or, to use its French name, the "Ordre du Mérite Militaire des Sip Hoc Chau". The inscription stands for "T'ai Federation". The T'ai Federation was an autonomous zone in Northern Vietnam and Northern Laos and its people were allies to the French in their war against the Viet Minh. Regards, Hendrik P.S. Could someone move this topic to either France or Asia ? 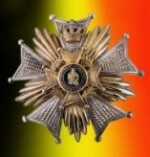 Were WWI Belgian medals produced during occupation?